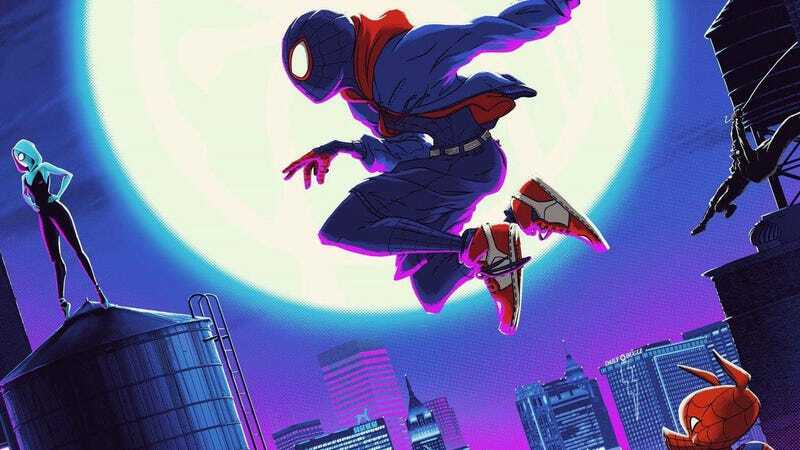 A small taste of an amazing poster for Spider-Man: Into the Spider-Verse. Artists Matt Ferguson and Florey have collaborated on two gorgeous new posters for the newly Oscar-nominated film, which we thought was the best film of 2018. The artwork captures all the different styles in the movie with colors that bring to mind the film’s impressive visual style. Plus, the posters have a surprising second dimension. The poster goes on sale at noon EST on Wednesday, January 23 through Bottleneck Gallery as well as Grey Matter Art, with two editions to choose from. Here’s the timed regular edition (which will remain on sale through Sunday, January 27 at 11:59 p.m. EST). The gallery will print as many as are sold, which will be a lot. And here’s the variant edition, which is limited to 250. Both posters are 24 x 36 inches and, in maybe the coolest feature, they both have a glow-in-the-dark element that looks like this. Both posters look like this in the dark. That’s right, it has a second hidden layer, just like Spider-Verse itself. Bottleneck Gallery and Grey Matter Art teamed up on these posters—and, again, you can get them starting at noon EST on Wednesday, January 23 at these two links. They cost $50 and $60 respectively. Corrections: The poster is for sale through both Bottleneck and Grey Matter, so we went ahead and added those links. Also, we added in the prices.